A pilot on the run. A cargo that’ll change the fate of the galaxy forever. And the might of the military working to stop Star Shepherd from delivering salvation to the people. Star Shepherd knows a raw deal when he sees one. And he’s got the worst one in the galaxy: to deliver a mysterious package to a rebellion to change the scales of power in favor of the common man. As he meets with an old friend to seek much-needed help, he draws the attention of a genocidal admiral willing to destroy entire worlds if it means catching Star Shepherd. Will Star survive the chase and bring hope to the rebellion, or deliver a gift into the hands of a worse power, tipping the galaxy into further chaos? 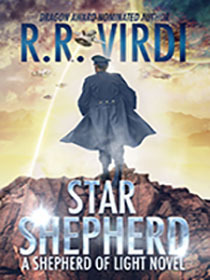 From two-time Dragon Award-finalist and Nebula-finalist, Star Shepherd is the first book in the Shepherd of Light series.